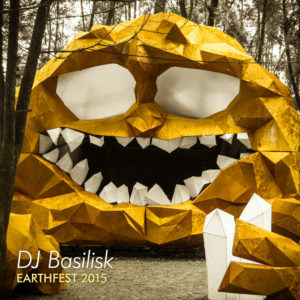 DJ Basilisk serves up a sizzling blend of neotrance, melodic techno, and progressive psytrance with Earthfest 2015, recorded live in the mountains of central Taiwan. This set showcases a lot of material from the Ektoplazm web site, particularly from the Digital Diamonds netlabel, as well as three unreleased tunes destined for Ben Rama’s newly minted imprint, Techgnosis Records. Recorded mostly live at Earthfest 2015 in Nantou, Taiwan. Due to technical issues with the original recording the last third of the mix was re-recorded at Head Shop Studios II, Zhongli, Taiwan. Depicted in the artwork is the actual stage design this set was played on. MP3 Download | FLAC Download · Download count: 13,404. So glad you are back!! thanks for the tasty beats cant wait to listen!! I’m glad you’re back! The new preview system that doesn’t use Adobe Flash is a very nice thing. But please put BPM values… I need them to only download albums with a certain value. Welcome back, Alexander! Keep up the good work. Nice mix. I am not only glad, but really happy to see yo back, but I still prefer track after track for i like to listen each one individualy. even though, will listen to them wit expectation. what a huuuuuge sound.. thanks a lot.. i would love to hear you in action somewhere on huge field. what a huuuuuge sound.. thanks a lot. Wow so many of my favorite techno/progressive/minimal/… artists in one 1h40 mix, let’s go!!! ¡Muy, muy buena recopilación! precisamente lo que he estado buscando este tiempo, gracias!! The tracks in this mix sound better together than apart, they are stronger as a whole more than the sum of their parts. Thank you for this mix!